If you have ever been engrossed in making a quilt or knitting a cardigan, you’ll have an idea of the satisfaction one can derive from such a pastime. 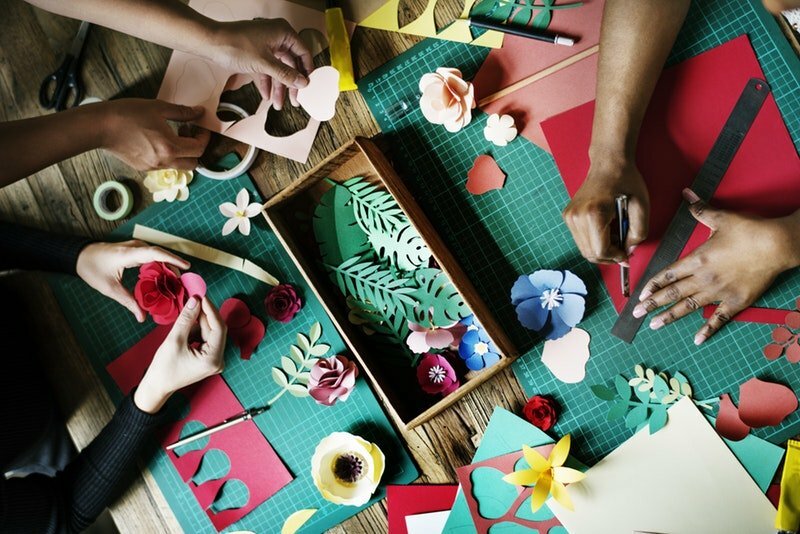 But the benefits of engaging in a creative pursuit like crafts goes beyond a personal feeling of satisfaction – crafting actually holds significant psychological and social benefits, which can contribute to wellbeing and enhance the quality of life. Here is a list of some of the benefits you gain from crafting according to research. The survey reported that they find knitting to be calming and that it relieves their stress. A recent comprehensive report that reviewed research on the health benefits of knitting found that knitting is as relaxing as yoga. The report, The Health Benefits of Knitting, was undertaken by Knit for Peace, a network of more than 15,000 knitters in the UK who knit for people in need. The same report from Knit for Peace found that knitting can distract the knitter from chronic pain. While working on a knitting project, the attention is diverted to the knitting, helping the knitter to momentarily forget about that nagging pain. In addition, the repetitive movements required to create a knitted item, create a meditative state and release the calming brain chemical serotonin, which can help to lift a person’s mood and dull pain. The report references research from Harvard Medical School’s Mind and Body Institute in 2007 which proved that knitting induces the relaxation response and lowers the heart rate by an average of 11 beats per minute. The report suggests that, since knitting has been found to lower blood pressure, getting people to knit can lower medical costs. Sewing and quilting have the same therapeutic value. According to a 1995 study sponsored by the Craft Association, sewing reduces three stress indicators: heart rate, blood pressure, and perspiration rate. Crafts like weaving, embroidery, knitting, and quilting have an amazing calming effect. While you’re involved in your latest project, all you can think about is how it’s going to look when it’s finished. This excitement and commitment to a project is a very effective antidote to daily stress and feelings of depression. This was also the findings of a study that examined the psychological effects of art-making activities like painting or coloring pre-designed mandalas, free-form painting, collage making, still life drawing, and modeling with clay art. The study found that these activities can significantly reduce a person’s state of anxiety. Another study found that engaging in creative activities can help to reduce stress and depression and to cope better with a chronic condition. Tackling a craft project whether it’s knitting a sweater, sewing a dress or making a quilt, involves following a pattern or coming up with your own design, both requiring the ability to think through problems. Taxing the brain like this keeps crafters mentally alert. It is therefore not surprising that the previously mentioned large-scale online survey of knitters by Knit for Peace found that knitting improved memory and the ability to concentrate. A study by researchers at the Mayo Clinic in Rochester, Minnesota, found that people who participate in arts and craft activities and who socialize in middle and old age may delay the development in the very old age of the thinking and memory problems that often lead to dementia. People who engaged in arts in both middle and old age were found to be 73% less likely to develop Mild Cognitive Impairment than those who didn’t participate in these activities. Even at a younger age, figuring out a pattern or mastering a new technique challenges the brain and contributes to the delay in the onset of dementia. There is joy and satisfaction in creating something useful and beautiful. The sense of accomplishment at completing the project is a great feeling not unlike a feeling of happiness. The Knitting for Peace study found that 81% of knitters who live with depression felt that knitting made them feel happier. A study that looked at the relationship between quilting and wellbeing found that crafts like quilting can meaningfully contribute to wellbeing. The study also found that quilters tend to have a strong social network that fosters the formation of strong friendships. Members support each other in their quilting efforts and this enhances wellbeing. This is probably true not only for quilting groups but also knitters and other crafters as well. Research has also found that members of groups who are involved in the same craft encourage each other and this helps to boost self-esteem. Finishing a project also acts as a self-esteem boost, whether it involved mastering a new technique that initially seems daunting or completing a simple project. The experience often gives a person new-found confidence. Few things are as satisfying as making something yourself. While the activity keeps you occupied creatively and productively there is also a great sense of satisfaction to be gained from seeing a project you have worked on and thought about for many hours completed. Now that research is confirming the many health benefits to be gained from crafting, it would be great to see a return of crafts education to the school curriculum.